All praise Glory and Honor to our Father, Lord, King, Redeemer, Sanctifier, Justifier, Keeper, Sustainer, Provider, Master and God! We have entered into a New Year and new opportunity for the manifested power of God to operate in our lives. In the past few months I have attended several funerals and most of those who had departed were much younger than me. It has caused reflection on how precious life is and reiterated the thought of no one knowing the time of our departure from this world. I am not saying this to cause a sense of sadness on today, but rather to ignite more joy in the fact that God has seen fit to keep us alive for such a time as this. Our focus this year over the next eight days is becoming Worship. There is a difference in doing a thing and being something. 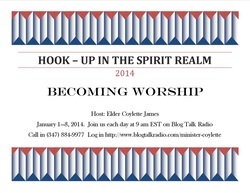 We shall go from just saying we worship God to allowing our lives to actually be Worship unto God. Praise is what I do, Worship is who I am. Now I know quite often Praise and Worship are synonymous with each other, but as we proceed through this week together I believe the Holy Spirit will reveal some of the mysteries of God to us to better equip us in becoming an instrument of Worship. Today is a day of reflection on the Goodness of God. No matter what trials and tribulations you encountered this past year, you are still standing by HIS grace. As you go through out today, do it in a place of adoration for God’s power and might in action in your life. You know better than anyone else all that you have endure this past year. You know without a shadow of doubt, if it had not been for the Lord who was on your side, you never would have made it. · I declare this will be the year I walk in the fullness of all that God created me to be. · I declare I will walk in victory therefore no attack of the enemy shall prosper. Those being used of me enemy for my destruction will turn from their wicked ways and see the error of their ways. · I declare goodness and mercy shall follow me all the days of my life, and I shall dwell in the presence of the Most High forever. · I declare my life shall not be lived in vain, but will be a testimony to the wonder working power of God manifested. · I declare my seed and seed’s seed are walking in the knowledge the Yeshua is the messiah sent to redeem us from our sins. And with that knowledge, they have yielded their lives to Him. · I declare sickness and disease is forbidden to dwell in my temple because I am the Temple of the Holy Spirit, therefore no unclean thing may reside in me. · I declare I have the authority to speak into and over the lives of my family and release the Power of God to work mightily in them and on their behalf. · I declare that my season of prosperity in NOW. I am enlarging my tents and becoming a greater vessel of blessings. · I declare my ears are attentive to the voice of God and with clarity I HEAR. · I declare this is my season of deliverance from every thought that would exalt its self above the thoughts of God for me. · I declare windows, doors and gates have opened on my behalf to prosper me in the things of God and promote me in the eyes of man. · I declare Shalom, Shalom over my life and the Peace of God that defines understanding is my constant companion. I am whole, nothing missing and nothing broken. · I declare that my adversities have not broken me, but have made me strong to endure to the end that I may win the race. · I declare this is my season of power and might and I will not allow ANYTHING to cause me to abort that which God has placed in me to birth out. To God be the Glory for all that is unfolding in your life! Father God with a heart of thanksgiving and worship I Praise Your Holy Name! Thank you for allowing me to cross over into a New Year and season in my life. As I reflect on your goodness and provision over this past year I am grateful. In my time of sorrow You have been my comforter, in my weariness You have been my strength, in my lack you have been my provider, in my sickness you have been my healer. I come now to say THANK YOU! For all you do for me and within me I am grateful. Thank you for loving me unconditionally! In the Name of Your Son Yeshua HaMashiach, Jesus the Christ I say Thank You. AMEN!